Callen and Jane had fun catching sea trout, ladyfish, jacks, bluefish and snapper. Typically the expression is "March arrives like a lion and leaves like a lamb" or vice versa... this year it has arrived like a seal, or maybe a penguin.. We have been having some cooler, cloudy windy days.. On these days we can still have fun with sharks, barracuda, redfish, sea trout, ladyfish, jacks, bluefish and snapper. Bud from Ga. with a nice red fish. Redfish tolerate the cooler water temperature and we can hunt them out of the wind, tight up against mangrove shorelines.. They love flies! 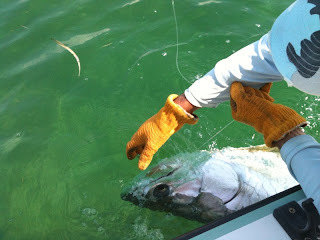 Rami scored this nice cuda on the flats.. Sight fishing for barracudas is a blast! They are incredibly fast.. I love watching them chase down a tube lure and attack it! Shea from Id. with her first barracuda! Finally warmed up enough for me to take of my fleece jacket today.. Looks like more warm weather is on the way! 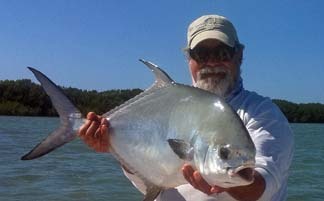 Warmer weather means permit and tarpon!! Been finding large laid up tarpon in the lay up basins on the warmer days.. It will only get better once the water warms up! !